And there it was. 24 Empire Lane, also known as The Fox Den. It was precious (a fitting adjective for something so tiny.) The landscape was perfectly manicured, the adorable signage on the home identified it as The Fox Den and the screened front porch looked to be ideally suitable for morning coffee or evening cabernet. Beyond the living room was the most spacious and well-designed kitchen with full-size stainless steel appliances. Let me restate that so you understand the importance of my shock: In our tiny home of less than 400 square feet, we had a spacious kitchen with FULL SIZE APPLIANCES. When you think about how much time you actually spend in the bedroom awake, you likely realize it’s probably the least utilized space in the average home. For this reason, we were pleased to know that with the many floorplan options Simple Life offers, we landed in the design that incorporates more space in the common areas than in the sleeping areas. Our sleeping arrangements (I slept in the downstairs master with a queen sized bed and Anastasia enjoyed the upstairs loft) were perfectly suited to our needs. I had a bed, a dresser, closet space uniquely designed with barn doors, windows for natural light and wall-mounted sconces for my nighttime reading. Anastasia accessed the loft through “stelves” (this is tiny home lingo – it’s a combination of stairs and shelves that lead you to the second-floor loft). We learned from our neighbors that most tiny home residents utilize the loft space for additional storage in their tiny home. Anastasia enjoyed the privacy the loft offered along with windows on both sides. Additionally, we had a full size stacked washer and dryer, a designated office area and stunning upgrades throughout like hardwood floors, tile backsplash, tile shower and plenty of storage including a shed outside that matched our precious tiny home. When you live in less than 400 square feet, you are more likely to get outside and enjoy life! The Simple Life community takes outdoor living to a five-star level. The amenities are just gorgeous and include a dog park with breathtaking mountain views. 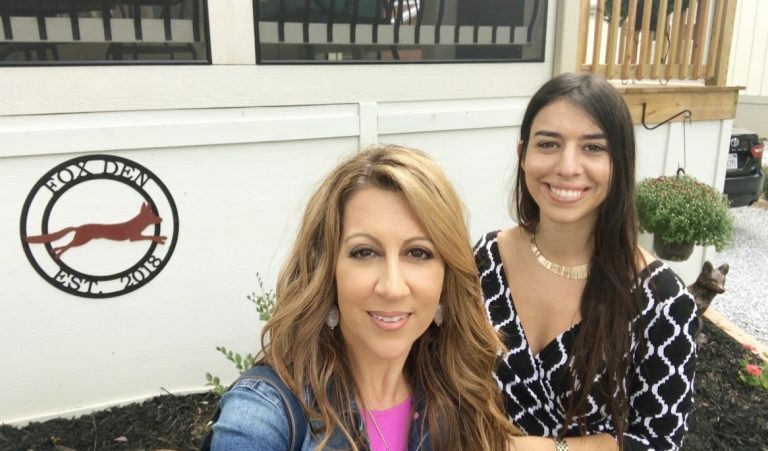 When you live in a tiny home you realize how important community is! Simple Life residents seem to almost live in a nostalgic world. It’s a throwback to the days when neighbors would stop by for a cup of coffee instead of the fast-paced crazy life of zooming from one place to the next without the much needed social interaction. And the activities and events at the clubhouse keep the neighbors busy! If you’ve never experienced tiny home living or are ready to make a change in your life, we highly recommend visiting Simple Life The Village at Flat Rock, North Carolina!